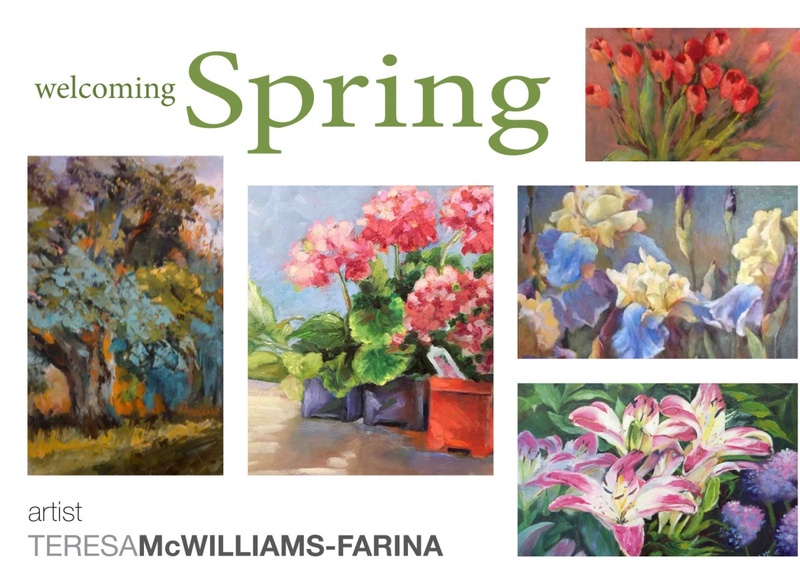 This event is an art exhibit featuring Philadelphia award-winning artist Teresa McWilliams Farina. A variety of framed original paintings will be exhibited from representational to abstract subjects in sizes ranging from small (5x 7") to large (24 x 36"). The artist's style is impressionistic. There are paintings on canvas (and copper) in textured oils, pastels on textured surfaces, vibrant watercolors and experimental pieces in mixed media. * Landscape subjects feature the New England area and are painted en plein air. My journey in paint ..... is my journey through life. I paint from my heart and have had a long love affair with color. I was “hooked” from the time I was 3 years old - painting with red nail polish on walls and my mother’s cotton bedspread. I moved to New England from Michigan after graduating from college in science, business management and fine arts. My husband and I have lived in the Philadelphia area for approximately 10 years. I have studied with a number of well-recognized instructors and artists in Michigan and the New England area. I belong to several local art leagues; participated in solo and juried group shows and received numerous awards for paintings in Michigan, Upstate New York, New Jersey and Pennsylvania (including The Philadelphia Sketch Club).